FREE CODE COMPLIANCE ASSISTANCE FROM STEPHEN TURNER INC.
JOE WAGNER JOINS STEPHEN TURNER INC.
Stephen Turner Inc. is pleased to announce that Joe Wagner is joining our team. His combination of controls, envelope, and project management experience make him a natural fit on our portfolio of high-performance commissioning engagements. A vastly experienced contractor and builder, Joe’s expertise in historic preservation, adaptive reuse, and building envelope will enrich both the new building commissioning and retrocommissioning sides of our practice. Prior to owning and operating Providence Restoration Company, Joe designed and maintained production machines and software controls. We are very excited to be exhibiting at Greenbuild 2017! Come see us at GreenBuild 2017 in Boston on November 8-9. If you missed us at NESEA Building Energy Boston, now is your chance to learn more about our exciting projects, personnel, and service offerings. Booth 2311!! Stephen Turner discusses the basics of building commissioning, why it's important to green building, and the future of sustainable building on Vertical City’s podcast. Listen: https://lnkd.in/ddWe66d. Vertical City interviews experts in architecture, urban planning, energy, agriculture and ecology to promote and develop solutions of sustainable living. They promote Vertical Cities that can save energy, support our growing population and preserve our land for food production, nature and recreation. Learn more at verticalcity.org. 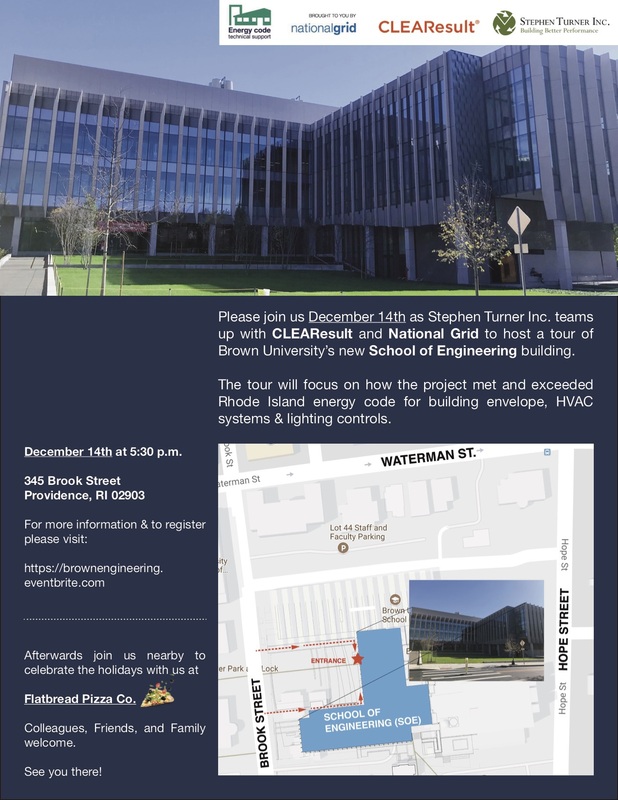 Stephen Turner Inc. provided training on changes in the 2016 RI Energy Conservation Code and offered a tour of the just-completed 134,600 square foot URI chemistry building. The tour was part of the Rhode Island Code Compliance Enhancement Initiative, and with support from National Grid and CLEAResult, Approximately fifty people attended the training, which focused on building envelope and lighting and lighting controls, the areas of least compliance in Rhode Island. The tour highlighted the URI project team’s solutions to those issues, including daylighting strategies and wall assembly types, as well as the creative HVAC solutions required by a laboratory building of this size. RI DEPARTMENT OF EDUCATION AWARDS MPA TO STEPHEN TURNER INC. The Rhode Island Department of Education has awarded a Master Purchasing Agreement for commissioning services to Stephen Turner Inc. Granted after the state’s RFQ process, the contract extends Stephen Turner Inc.’s position as an approved commissioning provider for Rhode Island public school projects for an additional two years and streamlines sourcing of commissioning services for school districts. Having commissioned more than 20 RIDE projects in recent years, Stephen Turner Inc. has developed significant expertise in RIDE and NE-CHPS commissioning requirements. We are delighted to have the opportunity to continue investing in our communities and the future of our children. The City of Cambridge has awarded the contract for the design, construction, turnover, and maintenance phases of the King Open and Cambridge Street Upper School and Community Complex project to Stephen Turner Inc. Having provided commissioning services for the feasibility and pre-design phases, we are grateful to continue working on this important and exciting project. Award on this Net Zero project, combined with the recent award of the city’s House Doctor contract, underline the effectiveness of our commissioning approach and the impact of commissioning on project success as a whole. After a rigorous proposal and interview process, the City of Cambridge, Massachusetts, awarded their Commissioning House Doctor contract to Stephen Turner Inc. The contract will enable the city to sole-source commissioning services from Stephen Turner Inc. for up to three years. Fourteen other firms submitted proposals under the RFQ, included several multinational construction and engineering heavyweights. The city’s award validates our approach, experience, and quality of work, and inspires us to continue striving to provide the highest standard of commissioning to our clients.